Myanmar is not only the picture perfect location in the heart of Asia, it is the people who will make the real difference and touch your heart with their kindness and generosity. But it gets better, food is amazing and yet to be discovered. 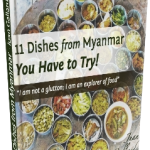 If Asian food is one of the best in the world, imagine a country with its own delicious cuisine plus a strong influence of its neighbour countries’ cuisines from Laos, Thailand, China, Bangladesh and India. Mohinga: This is Myanmar’s national dish. It is a fish noodle soup typically consumed for breakfast, although you can buy it from street stalls and teahouses at any time of the day. Pork Hot Pot: This is the most popular street food amongst the locals. There are sticks around the hot pot with every cut of pork you can think of including its intestines, ear, tongue, and more, which they love dipping in a chilli sauce. Tealeaf Salad: This salad is tasty and different to all the salads you could have ever tried. It’s a mixture of tealeaf, cabbage, onion, tomatoes, garlic, oil, salt, lime, and a mix of beans. Shan Noodles: They can be prepared in a salad or a soup. The soup is made with sticky and flat rice noodles and the salad version uses thicker rice noodles. The sauce is made from tomato, salt, sugar, sugar cane sauce, cooked bean powder (Dah), oil-garlic-tumeric sauce, spring onions, and coreanda. Tiger Prawn Curry: The curry sauce is delicious and pairs exceptionally with any fish or other seafood. This is a great dish usually found in coastal areas like Ngapali beach. Barbecue: It is very popular and very social to go to barbecue stalls where you choose the different sticks you want and usually share a fish with your friends. 19th street in Yangon is perfect for this. Falooda: Saving the best for last, Falooda is definitely, a winner dessert in Myanmar. It’s cold, sweet, and beautiful! Yum! 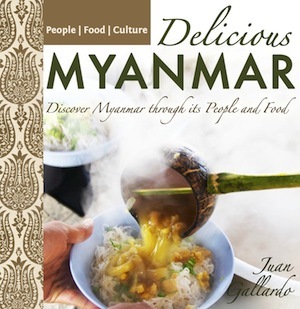 If you love food and Myanmar as much as I do, check out my book Delicious Myanmar to discover this amazing country through its People and Food.